Oklahoma residents interested in a growing field in the medical industry often choose diagnostic medical sonography. Read below and learn about the various ultrasound technician schools in Oklahoma, as well as the various programs offered. Individuals interested in becoming ultrasound technicians in Oklahoma have about six accredited ultrasound technician schools from which to choose. Accreditation is a requirement set by the American Registry of Radiologic Technology for any students interested in certification. The following Oklahoma schools offer ultrasound technician degree programs. Sonography training programs in Oklahoma have a blended curriculum of coursework, lab studies and clinical experiences at local health facilities. Course topics include ultrasound physics and instrumentation, small parts sonography, abdominal, OB/GYM and vascular sonography, medical terminology and patient care, among others. The student must complete the clinical portion, which provides them with hands-on training performing various sonography positions. Although it may vary, ultrasound technician programs are generally 2-year programs. The Oklahoma Medical Board requires their ultrasound technicians are licensed, which can be accomplished by passing a certification exam through the American Registry of Radiologic Technology. Licensure is good for two years; to remained licensed, the technician must complete 50 hours of continuing education credits, which can be taken through the American Society of Radiologic Technologists. As of May 2012, the mean annual wage for ultrasound technicians in Oklahoma was $60,930, according to the U.S. Bureau of Labor Statistics. Salaries for ultrasound technologists in Oklahoma may vary by location, level of training and experience, certifications obtained and employer. An entry-level technician may earn around $43,000, while an experienced technician may earn a wage has high as $89,000 in cities like Oklahoma City, OK. Ultrasound technicians with certifications in various areas of sonography generally experience higher wages. 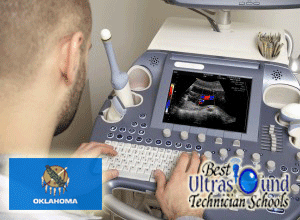 Oklahoma students have various diagnostic medical sonography degree programs from which to choose. Oklahoma City Community College offers an Associate in Applied Science in Diagnostic Medical Sonography that has students taking their courses at Moore Norman Technology Center. Students interested in attending a university can pursue the Associate in Applied Science in Cardiovascular Sonography program at Oklahoma State University. Bacone College offers an Associate of Applied Science in Sonography, as well as a 4-year Bachelor of Science in Medical Imaging. Diagnostic Medical Sonography programs usually have a selective admissions process that requires applicants meet all admission requirements such as completion of admission requirements and prerequisite courses.